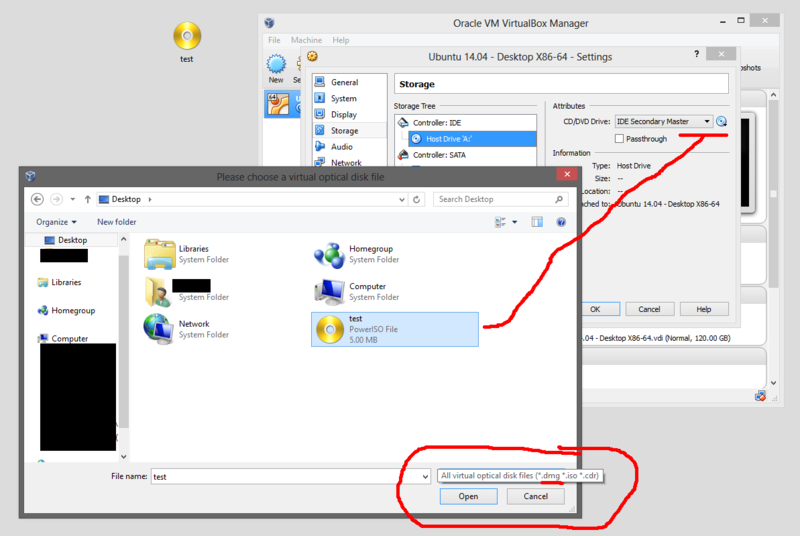 I posted an answer on ( Does Virtualbox support DMG files on non-Mac OSes? ), it was deleted, and cannot be undeleted. The reason being that it was declared as not an answer, but it is. 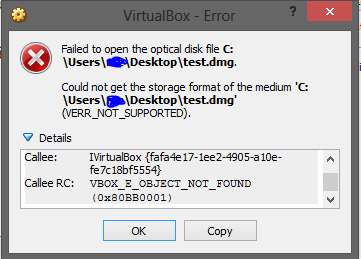 Can someone who used DMG files with Virtualbox on Windows confirm or deny this? So I took first hand test results with VirtualBox on Windows 8 that showed DMG is listed as supported when you browse for media, but that I too could not mount one. I also noted that our error messages were not the same, which I believe was a helpful note given that the OP has since discovered the error was caused by the dmg file they were using; they have successfully mounted a different dmg. I'm not saying my answer is the worlds greatest. Obviously a quote from the VirtualBox manual confirming support of dmg would be better than first hand test results, but I couldn't find a quote so I provided the next best thing. I believe the reason my answer was flagged, was that people mistook my comment about the error messages to mean that I wanted to get help solving a problem, when I was merely trying to point out that dmg mount failure can be caused by more than one thing. If I had had any information allowing me to elaborate on the errors I would have, but I didn't so I left it at that. Instead of telling me my answer is not an answer I would suggest people focus their energy on improving it by perhaps adding in what the OP, and I's errors mean. For the record there are currently 3 answers on the page. Mine (which actually addresses what the OP asked "Is DMG supported"), the OP's (Saying the error was due to a bad dmg file), and another user (Suggesting a work around would be to convert the dmg to another format). My answer should be undeleted, because while it does not addrress the later developed issue of what the error message means, it DOES answer the original question of DMG support on non-OSX hosts. I believe the reason my answer was flagged, was that people mistook my comment about the error messages to mean that I wanted to get help solving a problem. This was a consideration, but not completely the crux of the matter. Looking at the question and judging by the screenshot the user posted they would appear to be using Windows 7. The key part of your answer is the fact that you posted an image that shows that .dmg should be supported as it is shown in the file select dialogue, but OP would already have known this as they would have encountered this dialogue box in exactly the same manner as you did. The remainder of your answer is effectively stating "it should work, but I get a weird error" which is not an answer at all as it is simply echoing the question. If that needed to be said at all then it should have been a comment. OP has since answered the question (and probably the implied question in your answer) themselves with an answer stating that a different DMG file does actually work so there is something wrong with DMG support for certain files or the file he was using is corrupt. This is an answer as it clearly shows DMG support working. If your answer raises more questions than it solves then generally it will be poorly received by the community. In this case I believe there is currently too little benefit to reinstating your answer. You are free to edit it to include more information and re-flag it for undeletion though. When I try to mount a .dmg it does list dmg files in the explorer window. It doesn't mount successfully though. My error does not seem to be the same as yours. Yours complains about header information, mine complains about the storage format.